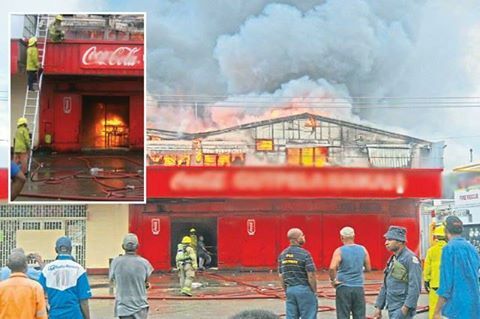 A fire in the heart of Port Moresby city is proving difficult for firemen to contain, taking away a fast food outlet last night, and three other businesses this morning. The fire at Boroko had taken out a fast food store yesterday, despite efforts by fire-fighters. The fire which was thought to have been put out, started again in the early hours this morning, razing out the Papindo shop, Johnston's Pharmacy and the Jacobi private medical clinic. The Executive Producer of Morning Tru on the NBC, Magea Buana, says there is enormous threat of the fire continuing on to destroy other shops and businesses in the chain of buildings, at the city's shopping hub. "Fire-fighters thought they had put it out last night, but fire started again this morning at around 6:30am," he said. "And right now the Johnstons Pharmacy is also gone, and the Jacobi Medical center is also going down now."